I am new to android development and was trying to use bluestacks to test my apps (as my pc won't run the emulator fast) but the bluestacks emulator is not being detected by android studio. I started bluestacks and then ran my app. On the choose device dialog it doesn't show bluestacks. I looked up in device monitor, but bluestacks wasn't detected there. I also tried using adb kill-server, adb start-server, adb connect 127.0.0.1 but that didn't work as well. It says "connection could not be made as the target machine actively refused it". All the solutions given in the other related stackoverflow post don't work. Android studio won't recognize bluestacks. Try in command prompt "netstat -anb" with administration privileges. Check if there is 127.0.0.1 5555 Estebalished. If everything is OK then temporary disable firewall and type"adb connect 127.0.0.1:5555" should work. in run(windows+R) put '%localappdata%\Android\Sdk\platform-tools' and check adb.exe is working correctly or not If not then download file from https://www.microsoft.com/en-us/download/confirmation.aspx?id=49093 which is Update for Windows 7 for x64-based Systems (KB2999226) (related OS) and install it. allow adb.exe as exception in your virus scan software don't treat this exe as malware. start your blue stack emulator. go in setting of blue stack emulator go in preferences click checkbox 'Enable Android Debug Bridge'. go to this location %localappdata%\Android\Sdk\platform-tools and run cmd through this location. put command 'adb connect localhost:5555' press enter in command prompt. start android studio then run project through play button popup will come with virtual device list, it will show your emulator's device. Not the answer you're looking for? 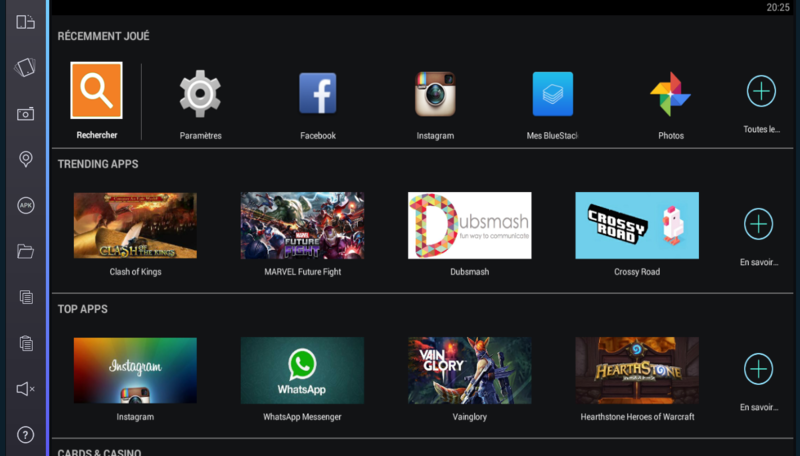 Browse other questions tagged android connect bluestacks or ask your own question.